Our comprehensive line of wheeled dry chemical extinguishers will be available in three types and designed to meet the majority of large extinguishing needs. 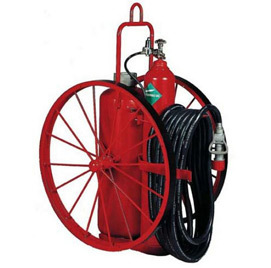 Typical use for wheeled extinguisher units: Refineries, chemical plants, remote construction sites, laboratories, processing plants, loading and storage areas. Dry chemical wheeled units are available for Class A, Class B and Class C fires.